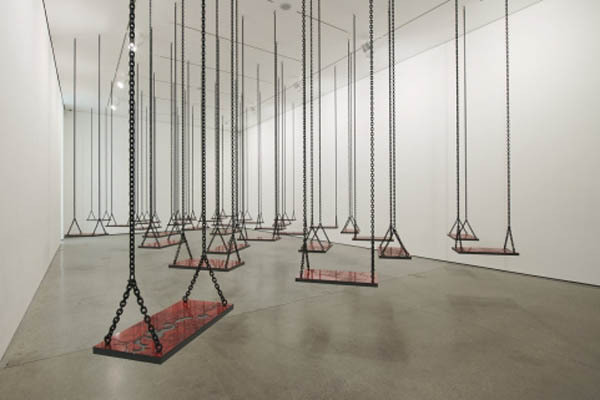 Born in Beirut, Lebanon, into a Palestinian family, video and installation artist Mona Hatoum has been living and working in London since the 70s. She identifies as Palestinian, not Lebanese, since she and her family became exiles and were never able to obtain Lebanese identity cards, as was often the case after 1948. Much of her art explores cultural displacement and exile. 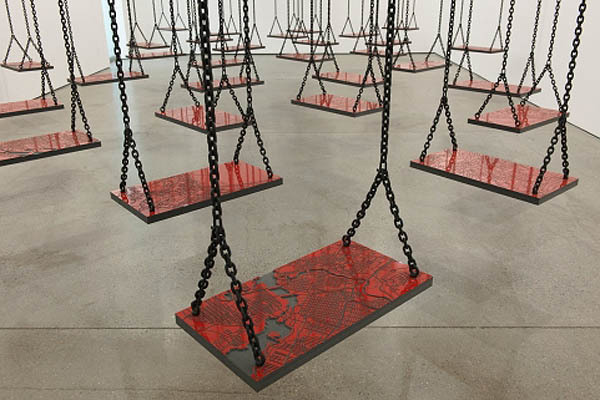 In her installation titled Suspended, a room full of swings initially evokes a playful atmosphere but, upon closer inspection, Hatoum has placed a randomly chosen map on each swing, representing the precariousness of war and randomness of its victims. Her earlier 6ft. Cheese Grater Divider, again, seems fun at first sight, but there is a violent, life-threatening quality to those oversized large blades.